The man can't speak English so why would he even try foreign languages? While everyone - and I do mean everyone - has been atwitter about Hillary Clinton's announcing her presidential bid, Scott Walker has been taking a taxpayer-funded jaunt through Europe. His obvious goal is to build some foreign policy chops in his own presidential bid. Scott Walker is learning that foreign policy and trade is a touchy business. Drop just one letter, as the likely Republican presidential candidate did Tuesday in Germany, and you can get laughed at. 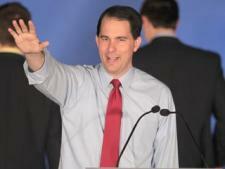 In a speech about transatlantic trade at an industrial fair, Walker called the Hannovermesse the “Hannover-mess,” incorrectly dropping the “e” in his pronunciation and drawing some chuckles from his audience of about 100 German executives. The compound noun is translated as Hannover Fair. It wasn't exactly an “Ich bin ein Berliner” moment. That's the phase President John F. Kennedy used in a famous Cold War speech in 1963 in Berlin that legend has sometimes incorrectly held could be translated as “I am a jelly doughnut,” instead of his intended meaning of solidarity with the then-divided city. This, of course, hasn't been Walker's first blunder in a foreign language. There is the time he wrote to Attorney Frank Gimbel and signed off with "Thank you again and Molotov" One just shudders at the thought of what might happen when Walker does a campaign tour through Israel later this year. "At (sic) his Gettysburg Address, Lincoln famously said, 'Four score and seven years ago our fathers brought forth on this continent, a new nation, conceived in Liberty, and dedicated to the proposition that all men are created equal' This was not just lip service, as evidenced from the words of contemporaries like Frederick Douglas (sic), former slave and early civil rights leader. Douglas (sic) said Lincoln was 'the first great man that I talked with in the United States freely who in no single instance reminded me of the difference between himself and myself, of the difference of color.'" Walker's screed against the Democrats, disguised as a tribute to Lincoln, goes on to say, "This sediment (sic) that all men are is equal is evidenced in the Republican Party's current platform of equal taxes on all, and opportunity for all regardless of race, gender, or age ... Contrast that with the tenants (sic) of the (sic) Barack Obama and the Democrat (sic) party ... "